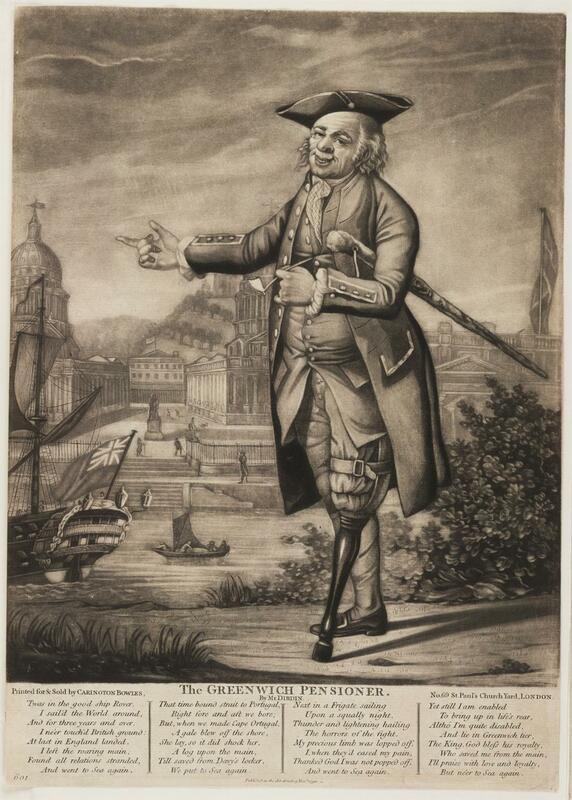 The Greenwich Pensioner, Charles Dibdin, 1790, Walpole Library. Greenwich Hospital provided a safety net for the sailors who kept Britain safe and flourishing. Deductions from the pay of merchant and naval sailors helped to provide for their care when they were disabled, as is this man. Dibdin created this piece (which was published by Carrington Bowles) to commemorate those sailors who gave everything for the nation, and to celebrate the way the nation cared for them. 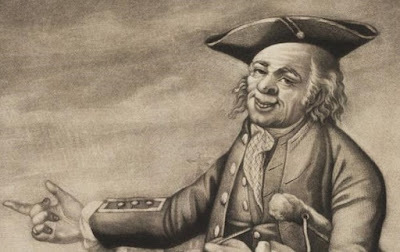 Our pensioner claims to have sailed on the Rover, a ship that I am fairly certain was invented for this song, as a quick search hasn't turned anything up on an eighteenth century ship rigged naval vessel by that name prior to 1790. Jack doesn't wear his slop clothes anymore, but a suit of clothes that hint at his former profession. A nice cocked hat bound in tape is cocked very far to one side, or perhaps worn backward. The balding pensioner's wile waist is still worn rather short, and he is clearly balding. About his neck is a checked neckcloth, tucked into a single breasted waistcoat. 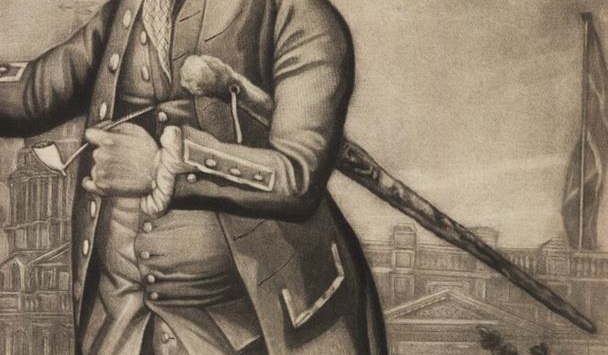 The sleeves of his coat (for it is too long to be called a jacket) end with mariner's cuffs which are also bound in tape. As you would expect of any good sailor (retired or not), our pensioner carries a stick under his arm and a pipe between his fingers. 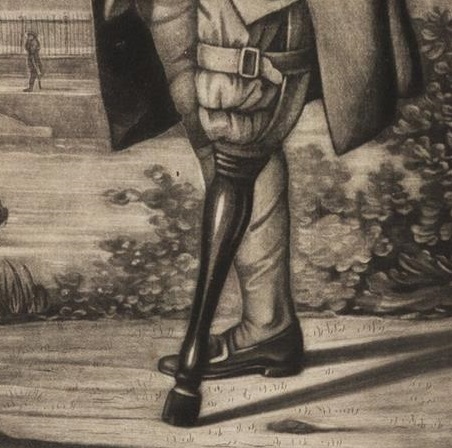 The most interesting detail of the entire piece is his finely carved wooden leg. A sort of scoop is fitted atop it to cradle the back of his stump. From there, a belt wraps around his thigh to hold it in place. It is a well turned piece of dark wood. His good leg is fitted with a pain stocking and pointed toe shoe with large rectangular buckle.